Recently I needed to identify where all the space was going on our server. Usually I just use the Folder Size tab extension but it requires scanning every time you close the Properties dialogue. 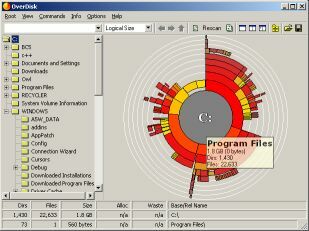 After looking around online I found a great free utility that displays the info in an easy to explore graphical view. OverDisk scans the drive or folder (this took around 10 mins for a drive containing hundreds of home directories) and then you can save the data so it does not need to constantly rescan (unless you make changes to files).You can also have it only rescan a certain subfolder rather than the entire drive again. It presents the information in a colour coded pie chart, allowing you to easily see which folders and files are using the most space. You can click on the folder and the pie chart will change to reflect that folder or click the middle of graph to go up a level. Right clicking on a folder gives you an easy option to Open or Explore in Explorer. This entry was posted in Utilities, Windows and tagged Folder, folders, graphical view, overdisk, pie chart, Size, Space, utility. Bookmark the permalink. Tree Size is also good for this. I use the free version regularly to check disk usage on servers. JdiskReport is one of the best I have found that is free.